from 60 pcs. 0,32 EUR ea. Bestseller: More than 16,4 million sold! 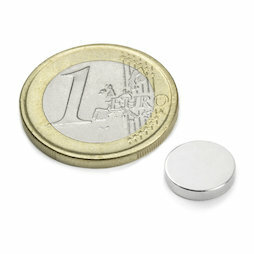 An adhesive force of about 1 kg with a 10 mm diameter and a 2 mm thickness make this disc magnet a top seller. It might be because you can embed it nicely thanks to its flat design. But it also works well for strong magnetic name tags. It is popular for making your own fridge magnets as well. As you can see, you can't go wrong with this magnet! Our customers have found a lot of applications for this super magnet. Browse through them below and be amazed at what you can do with it. If you have a larger project, you can benefit from attractive a gliding price scale.